A new surgical robot bores into the brain like a wood wasp. I just love biomimetic robots, don't you? Female wood wasps of the Siricidae family use an ovipositor, a needle-like shaft, to bore into pine trees and deposit their eggs. Two dovetailed shafts feature backward facing teeth. With each oscillation, the ovipositor moves a bit forward. Ferdinando Rodriguez y Baena at Imperial College London noticed that this boring movement is remarkably gentle in its application. He remarks "It can insinuate itself into the tissue with the minimum amount of force." His team has created a prototype medical probe; the silicon needle consists of two shafts with teeth just 50 microns long. Tiny motors oscillate the shafts to propel the device forward just like the wood wasp. Researchers hope that it can reduce the number of incisions needed to reach different parts of a brain tumor; it can crawl across the surface of the brain and then burrow in. This medical team is not the first group to notice the digging capabilities of the wood wasp. In a 1996 paper, a drill with similar inspiration was suggested for interplanetary exploration probes by Yang Gao; Ellery, Jaddou, and Vincent. 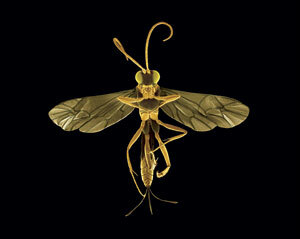 The woodwasp ovipositor, on the other hand, employs a longitudinal cyclical motion with its twin valves. Teeth on these valves alternately provide the reaction force required for drilling by the other valve. 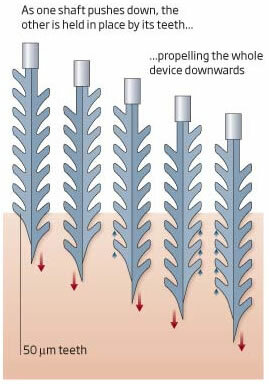 These teeth become pockets on different sides of the valves that enable waste to be transported up the hole. This device reminded me of the robotic mining worms from Emmett McDowell's 1946 science fiction story Love Among the Robots and the spaghetti-like robot earthworms from Harry Harrison's classic 1962 story War With The Robots. Seen close it was not completely flexible, but made instead of pivoted and smoothly finished segments. The robot pointed out the parts of int0erest. "...At the front end is a hard-edged orifice that drills a hole in the ground. Debris is carried back through the body of the machine and eliminated here: in operation it is not unlike the common earthworm. Sources: see New Scientist, Deployable wood wasp drill for planetary subsurface sampling (abstract only) and Biomimetics and robotics for space applications: challenges and emerging technologies (pdf).